This paper presents the non-destructive testing investigations performed on the Clock Tower (Torre dell'Orologio), placed in San Marco Square in Venice. Various levels of damage, developed on the tower during its life, have been investigated in order to achieve a structural diagnosis which is determinant for the optimisation of the restorative intervention. Comments on results obtained by "in situ" and by laboratory tests are reported. In particular, the preliminary phase of investigation, including magnetometric, endoscopic, sonic and ultrasonic surveys, flat-jack and relative humidity tests, is followed by specific chemical analysis. The information collected has been also elaborated for the localisation of the critical points in which measuring instruments have been installed so to monitor the deformational behaviour of the structures with time. The results presented, demonstrate the importance of non-destructive methods for the evaluation of the strength characteristics and of the static conditions of the structures under investigation. 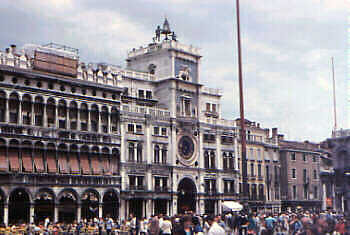 In 1493, the Serenissima asked Gian Paolo Ranieri di Reggio Emilia for a new clock in order to replace the one, called S. Alipio's, situated since 1384 on the façade of the Basilica of S. Marco. On November 3rd 1495, when the clock was almost ready, the Senate, in accordance with the Procuratori di S. Marco, decided to place it at the entrance of the Mercerie and that a new suitable building should be erected for that occasion. The construction was completed in two years and decorated by a huge bell and two bronze giants. In 1500 the Senate and the Procuratori di S. Marco decided to erect new edifices on both sides of the tower; this building site was concluded in 1506. In 1755 eight columns were added, in the seventeenth century manner, to reinforce the pillars at the ground level and support the two lateral bodies. By comparative analysis, since the appropriate documents are missing, the author of the enterprise seems to have been Mario Codussi. This can be deduced from similarities between the great arch and the Capella Bernabò in S. Giovanni Crisotomo; between the last order of the tower and the upper part of the Scuola S. Marco; between the profile of the first trabeation of the arch and the third entablature of the front of S. Zaccaria. The Clock Tower, enriched by the splendour of its materials, is one of the most important links between the Piazza and the rest of the city as well as a religious and civil symbol. The glittering gilded and enamelled faces of the Tower (Fig. 1) look on one side toward San Marco Square and the sea and on the other toward the crowded commercial district of the Mercerie and Rialto. The Tower with its rectangular shape perfectly fits between the two adjacent buildings and it raises on the arcade's trabeation which is supported by columns and pillars. On the facade of the edifice, toward the Square, three orders, with a degrading height (in successive ratios of 1:0.8) could be distinguished. The circular face-clock is placed just above the vault, within a marble bas-relief framework, surrounded by four small marble windows situated on the corners of this first sector; the complex functioning of the clock was there to exalt science, mathematics, mechanics and astronomy. The central order is characterised by a niche, decorated by columns, protecting the Madonna with the Child; around the sacred figures, symbol of the religious creed, Magi's homage was set; sideways of this, today there are two windows where it is possible to see the numbers of hours and minutes. On the highest part, there is the winged lion of San Marco, expression of the political power, with an open Gospel. This composition is in marble as well and stands out of a background, consisting of a blue mosaic and golden stars. As a conclusive element, on the terrace there are two Moors hitting a bronze bell. The facade facing the Mercerie is plastered in "marmorino" and painted, looking like Greek marble. From an early survey, it has been possible to identify a crack along the keystone of the arcade and various crack patterns on arch imposts. A very important influence on the deformation of the vault could come, even now, from temperature increase due to the presence of a glass-works oven nearby the arch (in proximity of the Mercerie side). It has been noted also that facing slabs of Istria stone or limestone show a considerable number of cracks. The cracking phenomenon is particularly evident on the pillars on ground floor where crushing signals are clear. Other cracks have been detected on the stone belt of the last floor. Their formation could have been induced by thermo-hygrometric dilatations and will require a continuous and accurate monitoring. To determine the structural and mechanical characteristics of the Tower, it has been necessary to undertake an "in situ" overhaul applying non destructive techniques such as magnetometric, endoscopic (in the walls and in the floors), sonic and ultrasonic surveys, flat jack and relative humidity tests. Their use provides not only important information on the homogeneity of the masonry and on the possible presence of areas of anomalous behaviour but also the parameters that may influence its mechanical behaviour. In order to detect the presence of metallic elements in the masonry structures, an induction magnetometer has been used, postponing the geometric and dimensional determination of the metallic bodies to the subsequent ultrasonic investigation. Two different probes have been used: a normal one, whose action field goes down to a depth of 100mm and a special one, whose sensibility allows to reach 220mm under the surface. The testing technique based on the use of flat jacks has been carried out in two selected points of the last floor, chosen after an accurate preliminary investigation. It has been possible to determine the stresses which correspond to s1 = 5.72 kg/cm2 and s2 = 4.41 kg/cm2 respectively. The relative high value measured on the last floor is probably due to the weight of the bell, of the two Moors statues and of the facing stones. It must be pointed out that the load is shifted so that the East side has to bear about a 30% higher weight than the West side. This result could be very important in the study of the subsidence of the north-east part of the Tower. The humidity content of the structure has been determined indirectly by measuring the relative humidity and by using specific equations. Relative humidity is measured by digital themo-igrometres placed at a certain depth of the masonry surface. Their probe are equipped with thin film humidity and temperature sensors. In the specific case, results have been useful for the determination not only of the capillary humidity rise in the lower floors but also of the spreading and infiltration through the roof in the upper floors. Relative humidity has been determined in two representative points; they are PC1, located above the vault impost of the east side arcade where the masonry is degraded, and PC2, in the north side above the vault where the plaster and the masonry seem to be in good conditions. In order to achieve a complete view of the actual situation of the Clock Tower, a second phase testing program, consisting of numerous laboratory investigations, has been carried out. In particular, this program has been developed in order to characterise the samples and to determine their physical properties. All of the analysis have been conducted according to ICR NORMAL and CNR recommendations and methodologies. Where a precise prescription was not present, routine methods have been followed. It must be pointed out that results obtained by non destructive tests give a global view of the conservation state of the structure as a whole and, above all, require no samples to be taken from the masonry which, especially in the case of historical monuments, could bring to serious damages to their integrity. For this reason, samples, which have been taken away for the laboratory tests, have been chosen from representative points of the structure. In this specific case, only two micro-drilling could be done: PC1 in a site of degraded state, PC2 in a site of sound situation. Approaching samples PC1 and PC2, a preliminary visual investigation has been necessary, followed by laboratory tests to determine the water content at 60 °C, crystalline water at 250 °C and loss of firing till 950 °C; the results are reported in table 2. Sample PC1 is composed by a yellow heterogeneous paste with numerous reddish and black mineral inclusions with many pores. Sample PC2 is constituted by vitreous-clayey mass in which 18% of quartz, feldspars and micas minerals as determined elsewhere. Some plaster and mortar coming from PC1 has been taken as a sample of degraded, non cohesive mortar. Plaster was done with lime, alluvial silicate-carbonate sand and little amount of "cocciopesto" (ground fire clay) while mortar with alluvial dolomite-carbonate sand and silicate in a minor quantity. As a sample of sound, cohesive mortar and plaster, the material coming from PC2 has been taken. Plaster was constituted by lime, alluvial silicate-carbonate sand and ground lava while mortar was done with lime and alluvial silicate-carbonate sand. Compressive strength on PC1 and PC2 has been determined. In this case, the samples have been cut out to obtain two cylinders with diameter and height equal to 50 mm. The results are reported in table 3. The important variations in the ultrasonic wave's speeds measured on the pillars of the ground floor (from about 1000m/s to 6500 m/s) have emphasised not only the different state of degradation of the elements under investigation but have also leaded to suppose substantial differences in the loads borne by the pillars. As it was not possible to take a sample out of the pillars of the Tower, which is under the protection of Sopritendenza, it was decided to go to the original quarry of the material that has been identified in the Orsera quarry in Istria. Two 5 x 5 x 20 cm prisms, marked A and B, of Orsera limestone have been prepared. As these samples and pillars are likely of the same origin, the tests done on the samples could be compared with the data recorded "in situ" on the pillars. Firstly, on samples A and B, the mean velocity of ultrasonic waves propagation has been determined. Then, the dynamic Modulus of elasticity has been calculated with a load ranging from 0 to 10 N/mm2 and finally the compressive strength. The results are reported in table 4. In the laboratory, the propagation velocities of ultrasonic waves have been measured on unloaded samples. The mean velocity measured is about 6000 m/s which is openly lower than the higher speed recorded "in situ" (6500 m/s) probably due to the not exact correspondence of the material. endoscopic surveys have shown a quite good walling joints filling in the mezzanine of the penultimate floor and on the last floor while the filling is scarce in the vault. The existing mortar is friable however the wooden pavement on the second floor is in an acceptable condition. Furthermore the endoscopic investigation made in pre-existing holes in the pillars of the ground floor has shown that the inner pillar's matrix made of brick masonry is very degraded and thus unable to bear independently the load which they are subjected to. flat jack test has emphasised a considerable load on the last floor. Of course the bell, the two Moors, the marble slabs and the stone frames load relevantly the masonry structure. The investigation on the East side has been particularly enlightening; in fact the load is 30% higher than in the West side. This could be a reason for the Tower's subsidence on the South-East side. E. Facincani, "Tecnologia Ceramica - I Laterizi", Groppo Editoriale Faenza Editrice.